The Hingol-Class maritime security vessels are designed for use by the Pakistan Maritime Security Agency. Image courtesy of China Shipbuilding Trading Co.,Ltd. Steel-cutting ceremony of a Hingol-Class maritime security vessel was held in May 2016. Image courtesy of Karachi Shipyard & Engineering Works Limited. The first two Hingol-Class vessels were commissioned into the PMSA in January 2017. Image courtesy of The Inter-Services Public Relations. 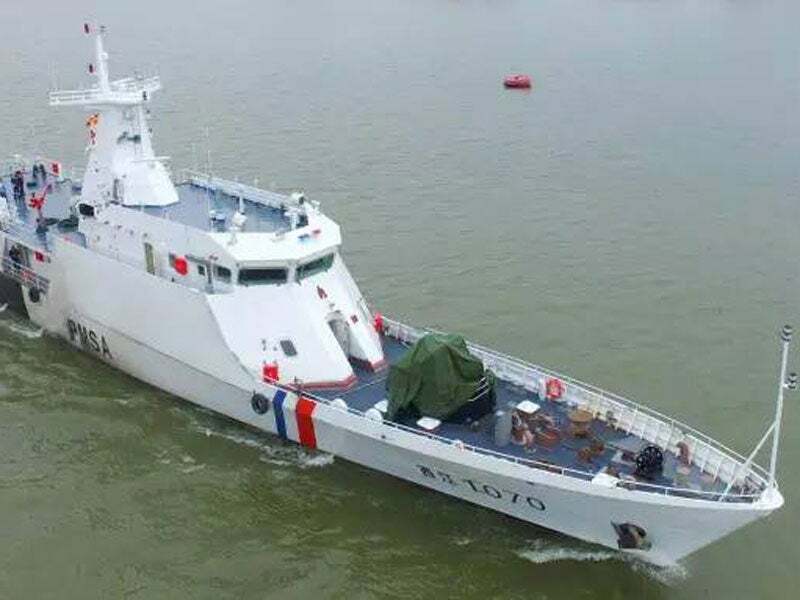 Hingol-Class maritime patrol vessels (MPVs) are a class of four ships being built by a partnership between China State Shipbuilding Corporation (CSSC) and Karachi Shipyard & Engineering Works (KS&EW) for the Pakistan Maritime Security Agency (PMSA). The vessels are intended to perform a number of missions, including patrolling, policing, search-and-rescue, maritime security, surveillance, intelligence gathering, pollution control and fishery protection in Pakistan’s exclusive economic zone (EEZ). In addition, the vessels can be used for disaster management and training operations. The Pakistani Government approved the procurement of four 600t maritime patrol ships for the PSMA in December 2014. In June 2015, the Pakistani Ministry of Defence awarded a contract to China Shipbuilding Trading Company (CSTC), a trading arm of CSSC, to build four 600t vessels under a technology transfer agreement with KS&EW. The four vessels are named after Baluchistan rivers, namely Hingol, Basol, Dasht, and Zhob. Construction on the first ship in the class began in November 2015 and the vessel was delivered to Pakistan in December 2016. The vessel was commissioned into the PMSA at Gwadar Port, Pakistan, in January 2017. The third and fourth vessels are currently under construction with deliveries scheduled to be completed by April 2018. The Hingol Class maritime security vessel’s hull is fabricated using steel, while its superstructure is made of aluminium. The vessel has a length of 68m, a beam of 8.7m and a displacement of 600t. The ship is controlled by the crew onboard from the wheel house, which is provided with navigational aids, wireless communication, damage control and monitoring system, as well as an alarm system. It carries two 6.5m-long rigid-hulled inflatable boats (RHIBs), capable of travelling at speeds of approximately 40k, towards the stern of the main deck. Launched or recovered using electric hydraulic crane, the RHIBs can be used for patrol and troops transportation. "The four vessels are named after Baluchistan rivers, namely Hingol, Basol, Dasht, and Zhob." Life-saving equipment carried by the Hingol Class includes four inflatable life rafts, life buoys, life jackets, and rescue equipment. The onboard anchors, towing and mooring systems deliver load handling capabilities. The main deck is equipped with one single-barrelled 30mm semi-automatic naval gun to defend the maritime patrol ship from inshore attack craft. A 12.7mm machine gun is mounted on port and starboard sides of the ship for use in patrol and anti-piracy missions. The ship is provided with a smoke locker, a missile system and a weapons storage unit, which is capable of holding two light machine guns, 18 pistols and 20 assault rifles. Safe vessel navigation is provided by the onboard navigation systems, which include GPS navigation receiver, automatic identification system (AIS), gyrocompass, magnetic compass, GPS navigation receiver, electromagnetic log, navigation radar, Navtex, and autopilot. External and internal communication sub-systems incorporated in the vessel provide reliable communication between the vessel and shore command base, as well as with other ships. The Hingol Class is powered by four 16-cylinder MTU 16V 4000M73L heavy-duty, medium-speed diesel engines, each generating an output power of 2,880kW at 2,050rpm. Each engine is connected to a reduction gearbox via flexible shaft coupling. Power for the electrical systems aboard the craft is generated by two generator sets. Four sets of propulsion shafting are installed to transmit drive from the gearbox to the propeller. The maritime security vessel offers a maximum speed of 27k and a cruising speed of 15k. It can travel to a distance of up to 2,600nm at speeds between 15k and 18k. It can reach up to 650nm in sea state 3 conditions at its top speed. The vessel has the ability to endure for up to 15 days. At EXPAL, we develop, manufacture, integrate and maintain equipment and solutions for the defence and security industries.